Border Patrol officers outside a bus in Presidio. Federal requests to hold undocumented immigrants in Texas jails longer so they can possibly be deported have dropped by the thousands, according to report released Wednesday. Data crunchers at the University of Syracuse found that the number of detainers — federal requests that a state or local jail delay releasing someone for 48 hours so deportation might be pursued — has dropped since 2012. Texas continued to lead the nation in the number of detainers issued in fiscal year 2013 and through March of 2014, the analysis found. The report comes the same week as a New York Times report that President Obama could issue an executive order as early as next week lifting the threat of deportation for millions in the country illegally, and allowing some to obtain work permits. Nationwide about 40 percent fewer requests were made from fiscal year 2012 to March 2014. While unable to pinpoint the drop's exact cause, analysts said in part it is the result of a growing number of state and local jails that have stopped honoring the requests. 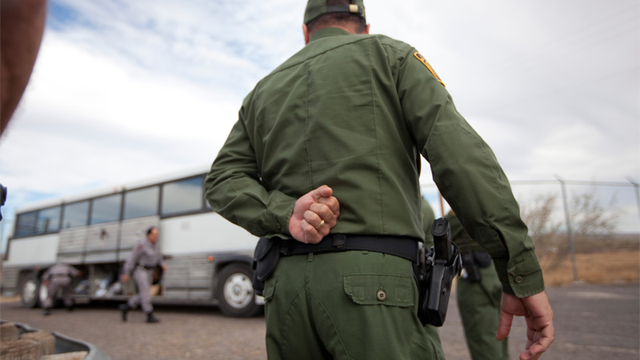 “Compliance with detainer requests was long considered mandatory. However, the agency recently acknowledged that compliance with ICE detainers is actually optional since detainers are simply requests and ‘they are not mandatory as a matter of law,’” the report states. Several law enforcement agencies will release an undocumented criminal if the alleged crime is considered minor and the person poses no threat to the community. Another possibility, the authors said, is that detainers simply aren't needed as often because people are returned quickly after being caught entering the country illegally. There is no simple cause-and-effect explanation, the report said. “Whether the drop in ICE detainers was a cause or consequence of stepped-up border removals, these two alternative pipelines together kept ICE detention beds filled in compliance with congressional mandates and fed the flow of ICE deportations,” they write. According to the New York Times report, the Obama administration later this month might grant as many as 5 million undocumented immigrants some sort of deportation relief along with possible work permits. The Pew Research Center’s Hispanic Trends Project estimated in September that about 11.3 million undocumented immigrants live in the country, including about 1.8 million in Texas. Citing sources in the White House, the publication added that the plan would allow undocumented-immigrant parents of U.S. citizens or legal residents to work in the country legally without fear of deportation. But proponents of comprehensive immigration reform said they'll believe it when they see it. Republicans have also warned the president of a backlash if he moves alone on immigration. "I hope he delays it permanently, but at least I hope the president would give us an adequate time to be able to work together to try to begin to build a bipartisan consensus on repairing our broken immigration system,” U.S. Sen. John Cornyn, R-Texas, the incoming majority whip, said on the floor of the U.S. Senate on Thursday. U.S. Sen. Ted Cruz, R-Texas, warned current Senate Majority Leader Harry Reid, D-Nevada, that the president would be “exercising powers properly belonging to Congress” if executive action was taken. Cruz also said that U.S. Attorney Loretta Lynch, the nominee to replace outgoing Attorney General Eric Holder, should be pressed on whether she supports the move.